Baby Shower Appetizers and finger food is how a party gets started! 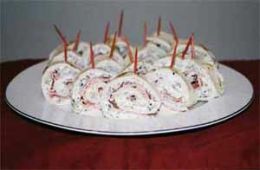 So here are some FABULOUS appetizer recipes for you to impress your guests! Enjoy! Blend cream cheese, chilies, and olives until well mixed. Spread over single tortillas and place ham slices on top. Roll up and slice like a cinnamon roll and place a toothpick in to hold in place. These can be frozen and served later. Simply thaw out before party. Mix and chill overnight. Serve as an appetizer in glasses with or without a spoon. Mix all ingredients together and serve as desired. Mix ingredients together and refrigerate until ready to serve. Good with apples, strawberries, grapes, etc. 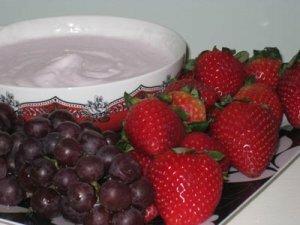 Other yogurt flavors can be substituted in place of strawberry. Mix well and chill. Serve with vegetable tray. Combine and chill several hours, or overnight. Great with fresh vegetables. Combine first 6 ingredients to make orange sauce. Cook one minute and allow to cool – set aside. Make your favorite sugar cookie recipe and roll out 1/8-inch thick onto a well-greased pizza pan. Bake at 325 to 350 degrees for about 8 to 10 minutes. Cool. Combine cream cheese, vanilla and sugar and spread over cookie. Top with fruit of your choice. Spoon orange sauce over all. Chill in refrigerator 3 to 4 hours before serving. Bottom Layer: Spread 1 large can of refried beans in bottom of 9 x 13 pan. Middle Layer: Mix together and spread on top of refried beans: 3 to 4 mashed avocados, 1/2 cup mayonnaise, 1/4 cup sour cream, 1 tablespoon lemon juice. Top Layer: Mix together and spread on top of middle layer: 1 package taco seasoning mix, 2/3 cup mayonnaise, 1/2 to 1 cup salsa, 2/3 cup sour cream. TOP WITH: 1 cup grated cheese, 1/4 cup chopped olives, 2 tablespoons green onions, 1/4 cup chopped tomatoes.